I. Fisken Steam Cultivating Machinery. In 1871, the Fisken Steam Cultivating Machinery was tried at the late Marquis of Tweeddale's home farm at Yester, and at Offerton Hall, near Sunderland. Both of these trials were attended by members of the Highland Society's Committee on Machinery, and reports of the observations then made will be found in the 4th volume of the Society's Transactions by Professor Wilson, Mr Swinton, Holyn Bank, and the late Professor Rankine, then consulting engineer to the Society. On perusing these reports, it will be found that circumstances prevented a full investigation being made, and that, while some defects in the machinery for conveying the power from the engine to the plough were noticed, there was nevertheless a general expression of opinion that the apparatus was admirably suited to perform the work required of it. Since 1871 Messrs Fisken have improved their apparatus so much as to warrant them in applying to the Judicial Committee of the Privy Council for an extension of their patent, which was granted in March, 1876, for a period of six years. On the same •grounds they exhibited a model of their apparatus, as now improved at the Society's Show in July last, at Aberdeen, and the Implement Committee, on consideration, recommended it for trial. In accordance with this recommendation, the Fisken apparatus was subjected to a series of trials, beginning on Tuesday the 14th, and terminating on the 18th November, on the farm of Liberton Tower Mains, the use of the ground and all facilities for making the trials having been kindly afforded by Mr Bryden Monteith, one of the directors of the Society. Thereafter, further opportunities occurred for testing the "System" on the farms of Mr Black at Liberton Mains, and Mr Gray at Southfield, both of these gentlemen having kindly given the Society the means of prosecuting their experimental inquiries. its starting point, so that it will be understood that the engine never requires to reverse or stop its motion, the endless rope continues to haul, and the action of the windlass in starting and stopping the plough and its consequent reciprocatory action all go on without involving the necessity of any signals between the man working the plough and the man working the engine. 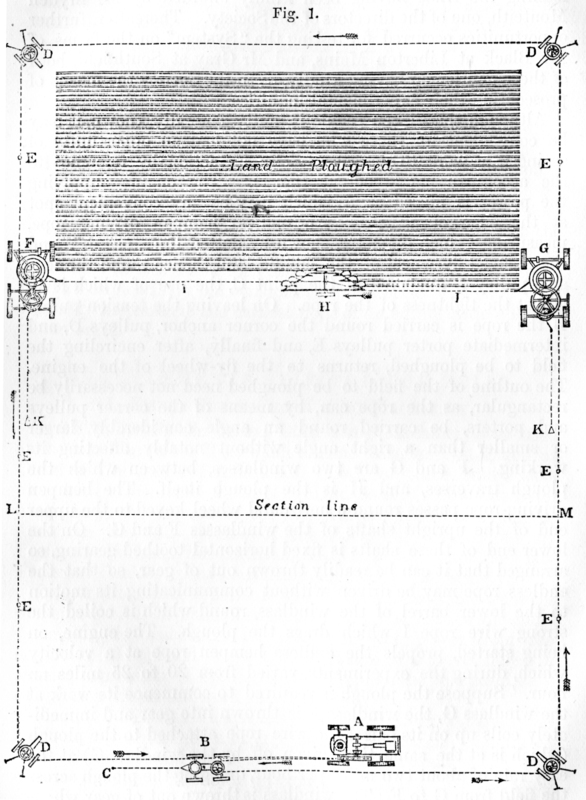 The mechanism of the windlasses for regulating the movement of the plough, as well as that for moving them forward as the ploughing proceeds, is ingenious; but it is not possible, without reference to enlarged diagrams, to describe the various devices which the patentees have introduced in their endeavours to perfect their system. 1st. The transmission of power from the engine by means of the fast travelling, light hempen endless rope. 2d. By the use of their windlasses, the fast motion of the endless rope can be applied to the slow motion required for the plough at any part of the field without stopping the engine. 3d. The use of one engine (and that may be any traction or portable engine of the ordinary type). 4th. The circumstance that the engine does not require to traverse the field to be ploughed, thus avoiding the risk of breaking drain tile pipes. 5th. The facility with which the power can be transmitted by the travelling rope enables the engine to be placed in a situation most convenient for the supply of water and fuel, the carts supplying which do not require to enter the field, the position of the engine being stationary. 6th. The small quantity of land left in headlands, the breadth of which averages 14 feet. In stating what have been represented as the points of superiority claimed for Fisken's Tackle, the Committee must point out that the trial now to be reported on was not of a competitive character, there being no competitive system of steam ploughing with which to compare it, and therefore, in giving their report, they must confine themselves strictly to the result of the investigation now made on Fisken's Tackle as represented in the model shown at Aberdeen. At the same time, they have to notice that the results of the present trials, though not embracing other systems of steam ploughing, and, therefore, not competitive, will nevertheless be useful should it be necessary hereafter to compare them with trials made on any other steam ploughing apparatus. Indeed, it seems doubtful whether two systems of steam cultivation could have been simultaneously considered at one competition in a satisfactory manner. "With these preliminary observations, the Committee proceed to give the following results of the various observations made, and the conclusions they have deduced from them. gradient of about 1 in 10, which was considered not unfavourable to obtaining a fair working trial of the powers of the tackle. (The position of the section L M is shown in Fig. 1.) The field was in stubble, with a very liberal allowance of farm-yard manure spread on it. The soil may be called light and free from stones. The weather throughout the whole of the trial was wet and very foggy, but not so wet as to interfere with the proper working of the apparatus. The engine used during the experiments was one of Robey's patent traction engines, 10 H.P. (nominal), weighing 10 tons 10 cwt. During the trials the fly-wheel averaged 140 revolutions per minute, giving an average speed to the driving rope of 22 miles per hour. The plough was Fisken's patent three-furrow plough, weighing 25 cwt., and cutting three furrows 8½ inches deep by 11 inches wide. The dynamometer used in making the trials was that of Messrs Easton & Amos. Draught of Plough and Tackle. We may therefore safely assume the average draught on level ground, with an 8½ inch furrow in light soil, at 16 cwt. ; and the correctness of this result deduced from trials on the sloping field was confirmed by trials made subsequently on a field that was nearly level. Uphill average velocity was 127½ ft. per minute, which gives 8.37 H.P. Downhill average velocity was 175 ft. per minute, which gives 8.02 H.P. So that the average horse-power may be stated at 8.2. From the description of the apparatus given at page 2, it will be seen that the proper arrangement of the corner anchors, porters, &c, which is a feature peculiar to the Fisken tackle, is not a work which can be done by the ordinary run of farm-servants without instruction. It is also an operation occupying some time, for which an allowance must be made in calculating the cost of work done. The Committee had only one opportunity of ascertaining the time taken to set up the tackle, and it was found to be two hours, but this was under the direction of Mr Fisken's able assistants, and the Committee can hardly arrive at any reliable result from that single trial. They have, therefore, no alternative but to adopt Messrs Fisken's estimate of the cost of "removals" at two shillings per day. Consumpt of Coal, Water, &c.
On a trial extending over a period of 3 hours, it was found that the consumpt of water was equal to 1099 gallons per day of 8 hours; and the consumpt of coal for the same period was found to be 14½ cwt., which, at 9d. per cwt. = 10s. 10½d. per day of 8 hours. It was found that on a trial of 3 hours, the work performed was 2a. 96p., which amounts to 6 a. 149 P. per day of 8 hours. But as the amount of work during the trials could not be kept up during a whole day, it cannot safely be used as a fair criterion, and we are disposed to think that the actual amount of ordinary work done would not exceed 6 acres in a day of 8 hours, which, at L.2, 17s. 4½d. per day is 9s. 6¾d. per acre. The Committee are aware that doubts have been expressed as to the durability of the working tackle, a subject on which they have no personal experience to guide them. They have, however, no hesitation in saying that the tackle is simple in its construction, and not, in their opinion, liable to failure. But as the opinions of those who have used the apparatus may be reckoned of some weight, they quote a few opinions on this point from Messrs Fisken's published notice of their patent. Mr Ingleton, of Minster, Sheerness, says, "The windlasses are practically as good as when they left your shop four years since." Mr Finn of Black Friars, Canterbury, writing in 1874, says, " We had out set of Fisken's tackle in December 1871, and have ploughed 978 acres with it, and are still using the rope which came with it;" and Mr Fenigan of Talacre, North Wales, in giving evidence before the Judicial Committee of the Privy Council, states that " he had cultivated 1200 acres without a shilling of expense having been incurred in the repair of the windlass, and the tackle was still in good order, working every day." David Stevenson, Esq., C.E. (Signed) "Bryden Monteith." "Southfield, Edinburgh, 2d December 1876. "Dear Sir,—I am duly favoured with your letter of this date, asking my opinion regarding the working of the Fisken tackle. "In reply, allow me to say that I am very much pleased with the work performed, and I am of opinion that it is superior to horse ploughing, and leaves the land in a better state for spring cultivation : and I may also state that all the practical farmers who had the opportunity of seeing here the work, and the working of the tackle, were highly satisfied. I may mention that in my field some boulders were met with, which will require to be all taken out, to save breakage and detention, and ensure successful working. David Stevenson, Esq., C.E. (Signed) " William Gray." "David Stevenson, Esq., C.E. "Robert Black." Two distinct questions arise in the investigation of steam tillage—First, What is the best apparatus for transmitting motion to the plough ? Second, Which is the best construction of plough for doing the work required. The Committee's attention has been confined to the first, and, perhaps it may be added, the most important of these inquiries, for if it can be determined which is the most convenient and economical apparatus that can be used for steam tillage, the form of plough best adapted for particular soils may be matter for further investigation. The perfect disintegration of the soil, so as to approach as nearly as possible to the action of manual spade-work, is the aim to be reached, and that must obviously depend on the kind of soil to be ploughed, whether clay or loam, for example, and hence the necessity of adapting the plough to the soil; and probably manufacturers may with advantage turn their attention to a still more perfect and easy means of adjusting the coulters and shares and mould-boards to the varying soils in which they have to work. This may in some measure account for the difference of opinion in the foregoing letters, though all of the writers, it will be remarked, give testimony to the satisfactory working of the tackle itself. After duly considering all the information that has been brought before them, the Committee have to report that the Fisken steam cultivation tackle is based on the ingenious conception of communicating power to great distances, by means of a rapidly moving light rope; that the mechanical arrangements for carrying out the conception and applying the rapid motion of the travelling rope to the slow motion of the plough, as recently improved, are well designed, and that the "tackle" performs its work in all respects satisfactorily. The Committee recommend that the Society should award to Messrs Fisken a premium of fifty guineas. Having laid before the Society the result of their investigations, the Committee cannot close this report without repeating that the favourable opinions they have expressed of the Fisken tackle must not be held as warranting a conclusion in favour of that system as the best that has been devised for steam culture. From what has already been stated, it will be seen that such a conclusion would be altogether premature. Some members of the Committee are well aware of the amount and excellence of work performed by Fowler's improved steam tackle, and it is well known that there are machines by other makers equally worthy of attention. It is obvious, therefore, that until these other "systems" (for so they have been called) have been subjected to trials similar to those which the Committee have conducted, no opinion as to the comparative merits of the different systems of working can be arrived at. It cannot be questioned that those whose duty it is to encourage any branch of scientific or practical research cannot at the present day afford to remain passive or inactive. New views, followed by new results, are yearly brought forward in every department of study, and whether such views be sound or false, they claim, and should receive full consideration. To this agriculture is no exception. The wide range of subjects embraced in its now acknowledged proper study includes, in those who seek the Society's diplomas and certificates, some popular knowledge of chemistry, natural history, veterinary surgery, botany, and engineering, and thus the Society acknowledges the general onward movement for inquiry, and while it may be a subject for difference of opinion in what may and to what extent the Society can best promote the dissemination of knowledge in some of those branches of study, it appears to the Committee that, as regards the construction and utility of new agricultural implements, no such difficulty exists. The appeal to a properly conducted trial is available, and the Committee regard it as a highly important function of the Highland Society to procure and supply to its members the best possible information on the merits of the different implements annually brought forward as new inventions, many of which have undoubtedly no good qualities to commend them. The application of steam-power to the tillage of the soil is pre-eminently one of those subjects which, from its importance, the Committee think should be fully investigated, in order that agriculturists may be provided with authoritative data for their guidance in selecting the implements they employ; and following-out this view, they are of opinion that every inventor who claims superiority for his system of steam tillage should be encouraged by the Society to submit it to a trial similar to that afforded by Messrs Fisken, who, the Committee think, deserve the special thanks of the Society for the personal trouble they have taken in submitting their invention so fully and unreservedly for examination by the Society's Committee. The Board approved of the report. II.—Robey & Co.'s Thrashing Machine. This machine (fig. 3) was exhibited by Messrs Robey & Co., Lincoln, and was tried with barley on the 15th, 16th, and 17th November at Mr Monteith's farm, Liberton Tower Mains. It is said to be of new design, and to embrace many improvements, chiefly the reduction of the weights of the shoes and riddles, and having enlarged bearings for the spindles. The lower part of the framework is also left open, so as to show the working parts, which is an advantage in regard to attention. The patent self-feeding apparatus consists of a covered hopper on the top of the thrashing machine, containing a shaking-board, on which the crop falls as it is filled in, and means of adjustment are provided to regulate the quantity of feed. There is a lever close to the attendant, so that the machine can be quickly stopped if required. The price of the machine is L.160. The machine was driven by one of Robey & Co.'s six horse-power traction engines, and the quantity of grain finished for the market per hour was six quarters. The Committee consider that the work done was most satisfactorily performed; that the various improvements which have been introduced, especially the new feeding apparatus, are most ingenious and likely to be useful, and think it worthy of the Society's gold medal. The report was approved. combs are in contact with the corn and weeds. The weeds are thus caught between the teeth of the comb, and are either pulled up by the roots, or, if too firmly planted, their upper portions are pulled off. As the d rum revolves, the combs carrying with them the weeds they have entangled, are gradually withdrawn into the slits, leaving the weeds they have taken up to be thrown off by the revolution of the drum. The comb having reached the highest part of the drum's revolution, and having thrown off all the cut weeds, is again gradually protruded, and prepared for making another cut in the lower half of its revolution. The revolution is rapid, and the cutting action of the blades almost continuous. The Committee are satisfied that the machine did useful work in removing the mustard while in flower, so as to prevent its seeding, and that many of the weeds were uprooted. It is possible that in practice a more favourable state of the ground and growth of the weeds could be selected for using the implement, so that a greater number of the weeds might be pulled up. We have to report an important fact—that the barley received almost no injury by the working of the machine. The Committee again inspected the field on the 22nd of June, when they found that the weeds had been very thoroughly eradicated from that portion of the field on which the machine had been employed. The Committee have no hesitation in reporting that the machine invented by Mr Ingermann did its work well, and that it may be usefully employed in all cases where fields are overrun with weeds; and they recommend that the Society's medium gold medal should be awarded to Mr Ingermann. This report was approved. This implement (fig. 5) was exhibited by George Sellar & Son, Huntly, and invented by James W. Barclay, M.P., and was tried at Mr Monteith's farm, Liberton Tower Mains, on the 15th and 16th November. The Potato Planters selected at the Glasgow Show 1875 were tried at Liberton Mains, 4th April 1876. The trial had been arranged to take place on a field at Powburn belonging to Mr Bryden Monteith, but owing to Mr Monteith's unavoidable absence the arrangements had not been completed, and the Society, after making a commencement there, was very much indebted to Mr Black, Liberton Mains, who most kindly offered to have the trial on a field which he was planting, and to furnish seed, horses and everything that was required. Six machines appeared on the ground, exhibited by—1. William Dewar, Kellas, Dundee; 2. Alexander Guthrie, Craigo, Montrose; 3. Charles Hay, North Merchiston, Edinburgh; 4. G. W. Murray &' Co., Banff (Ferguson's patent); 5 and 6. J. W. Robinson & Co., Liverpool (Aspinwall's patent). The Committee are glad to report generally that the machines were greatly improved since the trial in October last; and, with the exception of Aspinwall's machine, which appeared for the first time, they attribute that improvement very much to the trial formerly held. They believe that all the machines would have done their work well with whole seed riddled to one size; but on this occasion they were put to a thorough test, being tried with seeds of all sizes, both cut and uncut. 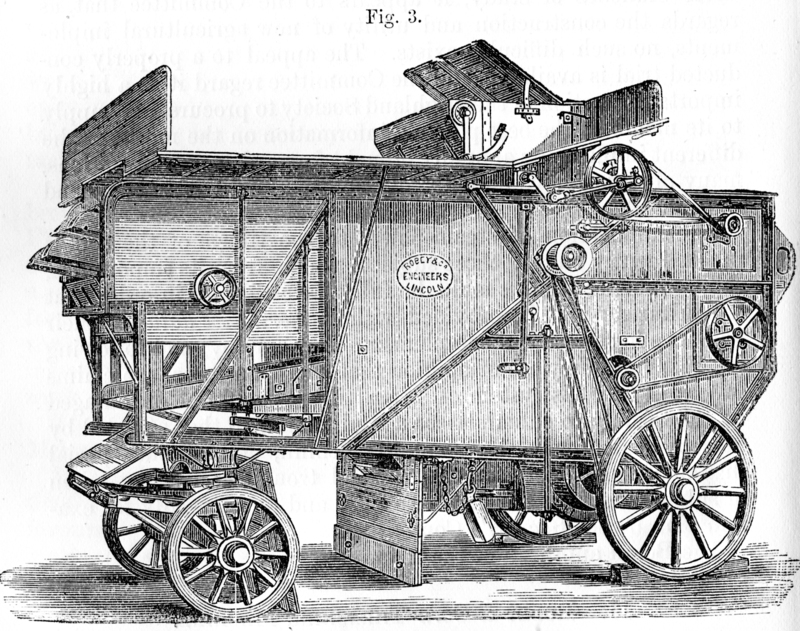 One of Aspinwall's patent machines being adapted solely for planting potatoes on the flat, not usually done in Scotland, and being of the same principle in the delivery of the seed as his other machine, it was not tried. After a thorough trial your committee selected three machines— viz., Mr Guthrie's, price L.14; Messrs Murray & Co.'s, L.18, 18s. ; Aspinwall's patent, L.12—and again subjected them to a further trial, each machine being drawn by the same horse. Messrs Guthrie and Murray & Co.'s machines are adapted to plant two drills, and are on much the same principle, the seed being raised from a hopper in cups, and dropped into the drilL Both machines are simple in construction, and not likely to go out of order, and appeared to be of much the same draught;— Messrs Murray's having this objection, that the horse and the wheels of the machine travel on the tops of the drills, which breaks down the drills, and makes the labour of the horse more severe. Aspinwall's patent plants only one drill, but is very light in draught; by a very ingenious invention the potato-seed is picked up by a series of steel needles fixed on a revolving disc, which lift it from the hopper and drop it in the bottom of the drill. It is simple in construction, and appears unlikely to be easily put out of order. Your Committee do not consider that any of these machines are thoroughly perfect, but at the same time the improvement is so marked, and the work really so fairly done, that they deem it right to recommend the Directors to award two prizes of, say, L.10 each to one of the double-drill machines constructed on the cup principle, and to the single-drill machine constructed on the needle principle. Your Committee had considerable difficulty in deciding which of the two machines on the cup principle was the best, but came to the conclusion that, taking the difference in price of the machine and everything else into consideration, they were justified in giving the preference to Mr Guthrie's machine. They would therefore recommend to the Directors to award a L.10 prize to Mr Alexander Guthrie, Craigo, Montrose, for double-drill potato-planter on the cup principle, and a similar prize of L.10 to Messrs J. W. Robertson & Co., Liverpool, for Aspinwall's patent single-drill potato-planter on the needle principle. Banff Foundry, N.B., 10th April 1876. (Addressed) F. N. Menzies, Esq. (Signed) G. W. Murray. After some discussion, it was moved that the report of the Committee be approved, and that Mr Murray be informed that the statements in his letter should have been made by his representative at the trial; which was unanimously agreed to. 1. Messrs Bisset & Sons, Blairgowrie.—This implement was exhibited at the Aberdeen Show. The mechanical contrivance by which the potatoes are unearthed does not materially differ from implements already in use. A deep-cutting broad cutter raises the plant, and a rapidly revolving wheel, with projecting arms, scatters the shaws and surrounding earth, and is supposed to throw out the tubers so as to be ready for being lifted. This operation the machine certainly performed, but the Committee did not fail to observe that a considerable number of the potatoes were fairly severed in two pieces; and when they consider how many more, without having been cut or severed, must necessarily have been bruised, they are led to the conclusion that the action of this machine cannot be conducive to the preservation of potatoes to be stored in pits. Seeing that the mechanical arrangement is, in principle, the same as that already employed in other machines, and that the improvement in detail still leaves the machine open to the objection of injury to the tubers, to which the Committee have alluded, they do not think it can be reported to have earned a prize. 2. Aspinwall's Patent, exhibited by Messrs J. W. Robinson & Co., Liverpool.—These exhibitors had two implements on the ground. The first was the implement exhibited at Aberdeen, which alone, of course, is entitled to be put in competition. But, on being tried, this implement was withdrawn, as it was stated by the exhibitors that it was not applicable to damp soil and luxuriant shaws. The second implement had been made with an arrangement for a freer separation of the potatoes from the earth and shaws; but this implement, though exhibited, cannot compete, and the Committee have to report that they do not. find Mr Aspinwall entitled to a premium. The Committee take this opportunity of reporting that the raising of potatoes and separating them from the roots to which they are attached, and from the earth in which they are embedded, without injuring their skin, is an operation not without great difficulty, and it seems to them that in the implements exhibited to-day, and in all others they have seen which profess to do the work required, the speed of the revolving machinery employed in separating the potatoes from the soil is far too rapid and violent to be consistent with raising the potatoes in a state to be advantageously stored in pits. This apparatus was exhibited at the Aberdeen Show by Messrs Joseph Davis & Co., London, and was tried by the Committee on the 28th of November. The Committee, after experimenting with several of the tests, consider that they are well known, but that they would be of comparatively little use in the hands of a person not educated in chemistry. They are of opinion that no prize should be awarded. This Machine was exhibited by Messrs George W. Murray & Co., Banff, and was tried in the show-yard on the 28th of July. It was seen at work with barley and oats, and did its work in a very satisfactory manner. The Committee added that they found that the price was moderate, and recommended that it be awarded the gold medal. The board approved of the report. The local committee appointed previous to the Aberdeen Show, 1876, met at Balhaggardy, Inverurie, on Thursday the 30th of November. Present—Messrs Alex. Auld, Newton of Rothmaise, Insch; James Reith, South Auchinleck, Skene; and George Wilken, Waterside of Forbes, Alford. Messrs Robert Salmond, Nether Balfour, Durris, and Alexander Yeats, Aberdeen, were unable to be present in consequence of indisposition. The members present appointed Mr Wilken to act in Mr Salmond's absence as convener, and also, in consequence of so few of the local committee being able to be present, agreed to ask Messrs Campbell, Kinellar, and Stephen, Conglass, two of the local committee, to act as judges of the turnip-raisers along with those present. After inspecting the four machines set aside for trial, all were considered nearly the same as those exhibited at Aberdeen, and all were allowed to compete. The field was admirably adapted for the purpose, being quite free from stones, and the whole of the machines were very efficiently horsed by Mr Maitland, Balhaggardy. The turnips were a superior crop, and at least a fourth of an acre was allowed for each machine, both of Swedish and yellows. There was little difference in the speed of either machine, all performing at the rate of three-fourths of an acre per hour. The work done, taken all over, was fair. The judges separated the machines into two classes. 1st. James Thorn, Leden Urquhart, Strathmiglo, No. 1694. This machine requires two horses, takes one drill only, throws the turnips to one side, the same as a potato-digger, and performs the work far superior to any of the others. Recommend it be awarded a silver medal. 2d. Adam T. Pringle, Edinburgh and Kelso, No. 652. This machine also requires two horses, takes two drills, lifts the turnips and leaves them on the surface, and performs the work fairly. Recommend it be awarded a medium silver medal. 3d. Duncan Boss, agricultural factor, Inverness, No. 1617. This machine also requires two horses, takes two drills, and simply tops and tails without removing them from their original position. Recommend it be awarded a minor silver medal. John Gregory, Westoe, South Shields, No. 1195. This machine requires only one horse, takes two drills, tails only, and leaves the turnips in their original position. Recommend it be awarded a medium silver medal. The Board approved of the report, and confirmed the awards as suggested.